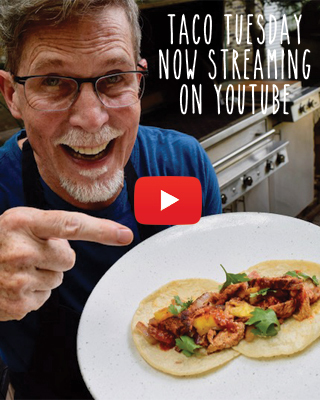 Rick Bayless | It’s (Tuna) Taco Tuesday!! I know tuna steaks aren’t the first thing that come to mind when we think about tacos, but stay with me. 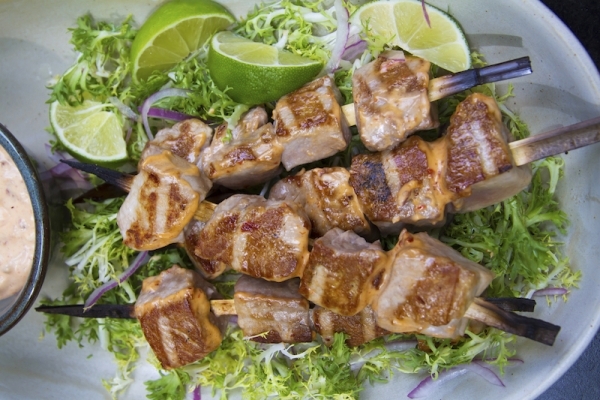 Grill-seared cubes of tuna — plus a slathering of spicy-creamy chipotle mayo, a bed of toothsome, bitter frisée and a squeeze of lime — cry out for warm tortillas. Key to your success will be buying good ingredients — off-brand fake “mayonnaise” won’t cut it here. And you’ll want to opt for super fresh, sashimi-grade tuna. Two more quick tips: Flat skewers will solve all of your skewering woes. Also, you’ll need to get your grill ripping hot for searing the fish. Heat one side of a gas grill to medium or light a charcoal fire and let it burn until the coals are covered with gray and still quite hot. Combine the mayonnaise, chiles, and lime juice in a small food processor or blender and process until smooth. Add a little water if needed so the mixture runs smoothly through the blades. Transfer the chipotle mayonnaise to a small bowl. Line a platter with the greens, lime wedges, red onion slices. Thread the tuna onto skewers. Spray or brush with oil and sprinkle with salt. Place on grill and grill for about 2-3 minutes. Brush with some of the chipotle mayo and flip to the other side. Brush the other side with more mayo and grill for 2-3 minutes more. Remove the skewers from the grill and transfer to your platter. Serve with warm tortillas. The family raved over these tacos!!! The sauce perfectly complemented the delicious tuna. We picked it up from Carnivore out in Oak Park. Carnivore is an awesome spot! Thanks for reading, watching and cooking along with #TacoTuesday!